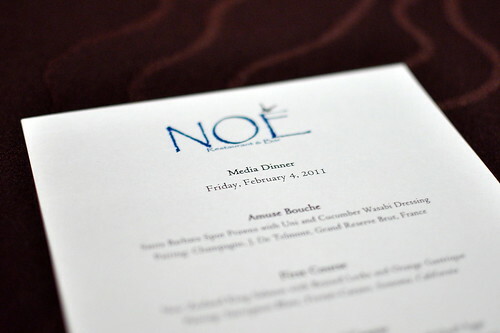 Last Friday night, I was spoiled rotten by the Omni Hotel in downtown Los Angeles. 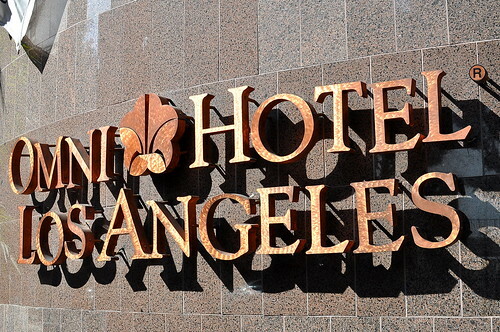 Renovations are currently underway at the hotel, and I was invited to preview the spruced up rooms and restaurants with a handful of media hounds. 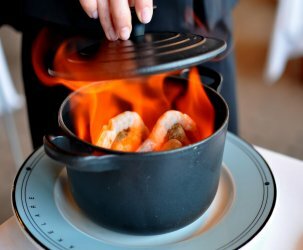 My 18-hour staycation began with fireside drinks on the outdoor terrace of Noe Restaurant & Bar, followed by a four-course dinner with wine pairings orchestrated by Executive Chef Glen Ishii. Chef Ishii, who has cooked at Noe for the past six years, draws inspiration for his menus from the seasons and from traditional Japanese cuisine. Hotel restaurants usually don’t have a great reputation for interesting fare, but the Omni is an exception. 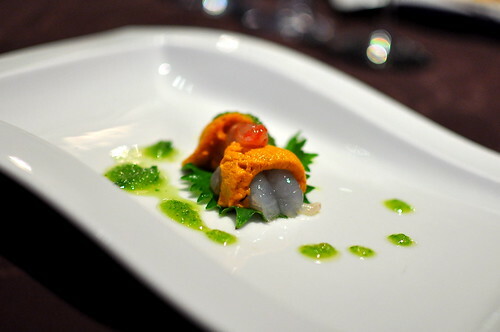 To start, the chef sent out an amuse bouche of raw Santa Barbara spot prawns draped by sea urchin with a cucumber wasabi dressing. Both the uni and the prawns were impeccably fresh. The dish’s simple and clean flavors provided a great start to the meal. 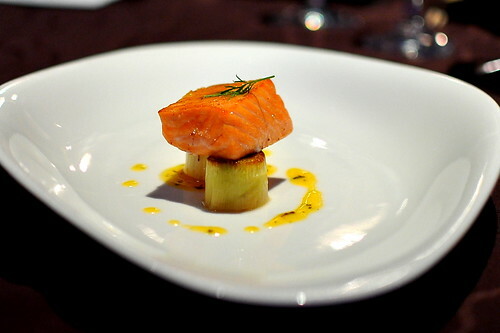 Next, we were served a petite fillet of New Zealand king salmon with braised leeks and orange gastrique. The salmon was lightly poached, keeping the flesh delicate and supple. The fruity gastrique paired very nicely with the fish. I found the Stonehenge-like presentation fairly amusing. 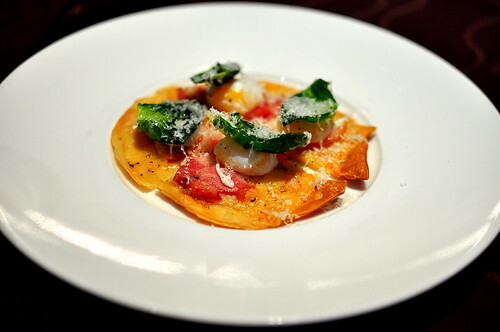 The second course was a flat bread topped with pancetta, Brussels sprouts, and poached quail eggs. It was a tasty and adorable little bite that had a different tone than the courses that preceded it. 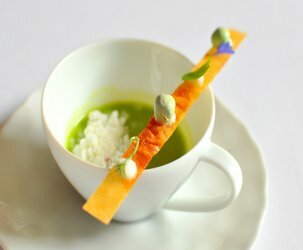 A bar bite in the middle of a tasting menu? Sure, why not! 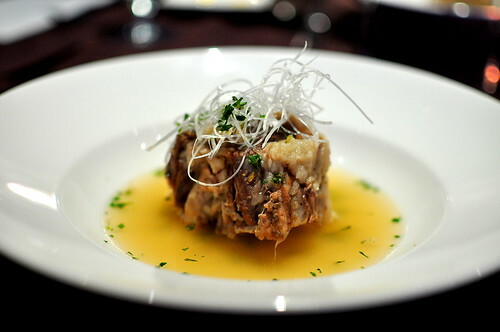 My least favorite dish was the Vietnamese-inspired oxtail soup. It was served lukewarm, which caused the fatty bits to congeal unappealingly. I was also disappointed that the meat didn’t fall off the bone and that the broth was meekly seasoned. 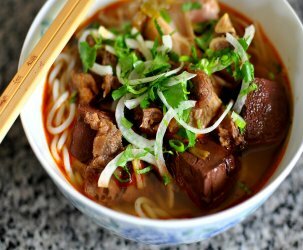 Mostly, I just had a hard time separating traditional phở from the loose interpretation I was served. 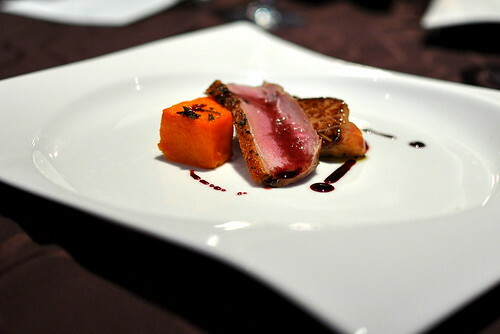 Chef Ishii bounced back nicely with the following course—maple leaf duck breast served with seared foie gras and roasted butternut squash. All three elements were perfectly executed, especially the duck. The butternut squash, which was roasted with sage brown butter and maple syrup, provided a lovely contrast to the rich foie gras. The course that excited me the most was the “Noe Cream An Mitsu 2011.” The base was a downright silky panna cotta made with a touch of tangy buttermilk. 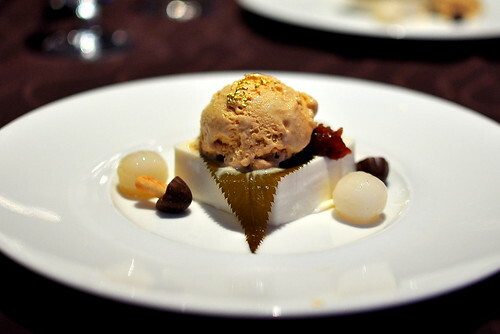 It was topped with a salted cherry leaf and kinako (soybean powder) flavored ice cream. Adorning the plate were sticky, chewy tapioca balls and chocolate and shortbread “mushrooms.” Desserts with an Asian flare never fail to put a smile on my face. Following dinner, Kat and Monica from JS2 Communications, Lien of City’s Best, and I hoofed it to the 17th floor Club Lounge for a nightcap. We were treated to sweets, booze, and more sweets. This was way more fun than the sleepy slumber parties of my youth! 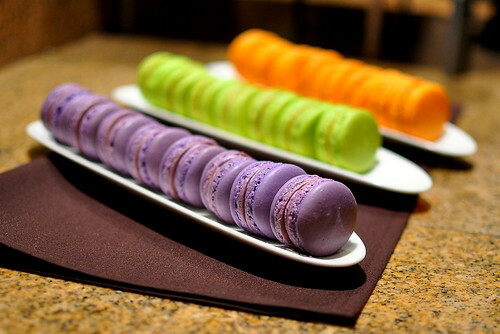 Chef Ishii even made special macarons just for us—blueberry, pistachio, and orange. I told you I was spoiled! Sometime around 2 AM, we decided to call it a night and retreated to our rooms. 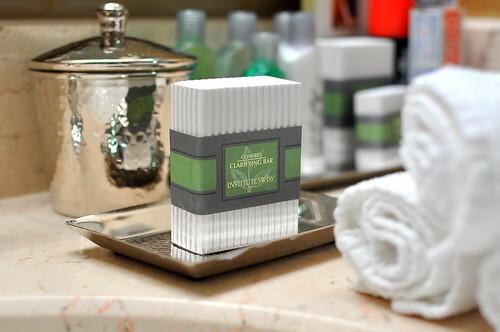 I think one of the best perks of hotel living are the specialty bath products. That, and a super-comfy bed! The ones at the Omni come with a pillow-top mattress. I had a most luxurious night of sleep upon it. Before departing the following morning and returning to my dramatically less swanky digs, we dined at the Omni’s breakfast buffet at the Grand Cafe. 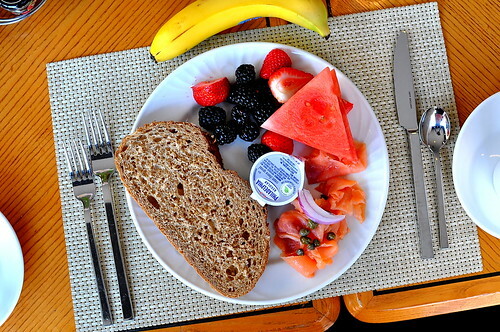 I piled my plate with fresh fruit, smoked salmon, and bread, while my fellow guests indulged in made-to-order omelets, bacon, and sausage. Thank you to the Omni Hotel Los Angeles for treating me like a queen and to JS2 for making this 18-hour staycation possible. Sometimes a gal just needs a fun little getaway. 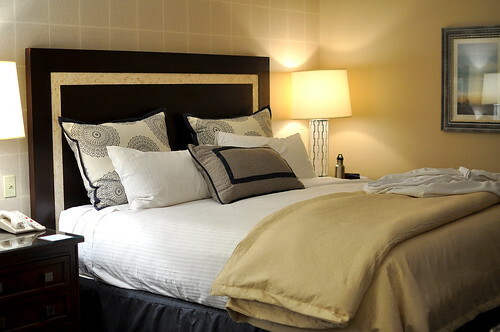 Cathy – what a wonderful experience — that has to be the best 18 hour stay-cation ever! 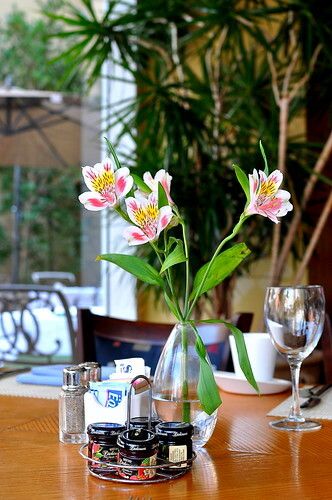 Delicious food and a swanky room…what else could a girl ask for? You had me at “Stonhenge”. Yet another site that accepts favors for favorable reviews. How sad. Treated like a Queen…it really did seem so from those pictures! Lucky you! Thanks for sharing, what an opulent staycation! Hey Cathy, I had a great time at the Omni, too, paid for by a concert promoter while I was on tour. It’s very true, we can be honest whether we pay or not.Paid versus free has nothing to do with it, at all,it’s all about the reviewer, whether or not you trust them.Hey, did you get a late check-out? How fun! 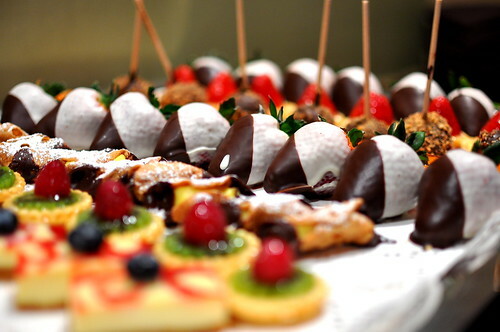 All of those desserts look fabulous, but I think the most enticing thing in the whole post is that bed!